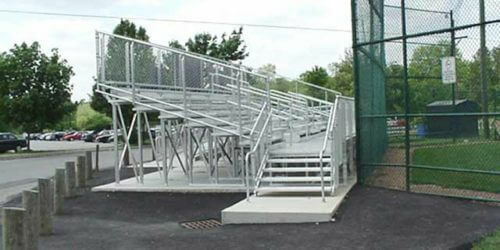 For all your aluminum bleacher needs, SightlinesBleachers.com has you covered. Choose from our line of 5-row and 10-row TSA elevated portable aluminum bleachers, which seat as much as 54 and 184 people, respectively. 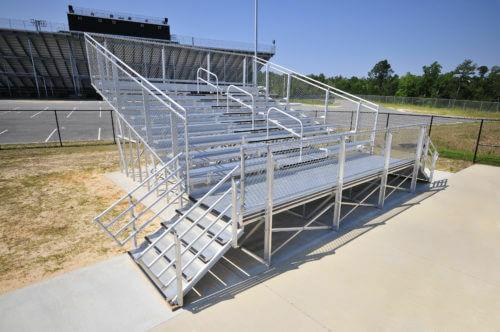 Small installations – Our five-row TSA elevated aluminum bleachers provide a wide selection of seating capacities. 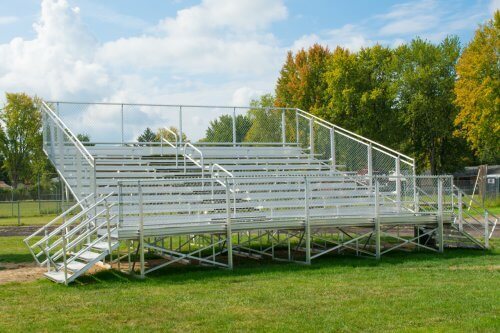 From aluminum bleacher models designed to hold up to 54 people to those meant for a capacity of 94, we have it all. Our elevated aluminum bleachers are fully IBC compliant and offer a front walkway that is elevated 30” above grade with two sets of steps off each end of the walkway. These TSA elevated aluminum bleachers have heavy duty welded aluminum tube & angle frame understructures with double footboards and risers on all rows, a 5-foot wide aisle with handrail, and a rail system on sides, front and back. When there’s a call for more seating, our product line delivers. Our ten-row TSA elevated aluminum bleachers can hold between 104 and 184 people, depending on the model selected. Security features are prominent in all of these designs, including end and rear fencing to prevent fall accidents. Our rugged aluminum bleacher designs are perfect for all kinds of weather and provide the durability you need to ensure years of use. Our vertical square tube structural members are stronger than any of our competition’s aluminum bleachers. We construct our aluminum bleacher square tubes at a minimum 2”x 2” heavy wall 6063-T6 aluminum. For more information about our 5-row and 10-row TSA elevated aluminum bleachers online, get in touch with our team at SightlinesBleachers.com. We’re always happy to answer any questions you might have about our aluminum bleachers.